Explanation: The robot rover Sojourner sees Mars from the perspective of a house cat. 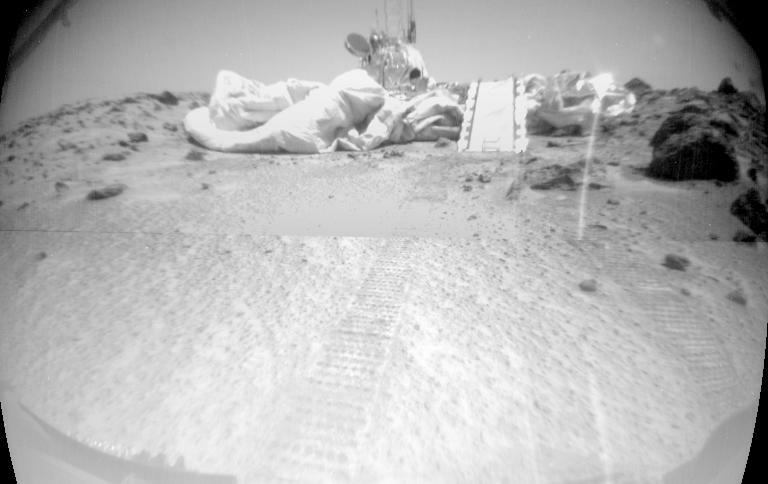 During the 7 month cruise to Mars aboard the Pathfinder spacecraft, Sojourner measured only seven inches tall in a stowed position but prowling the martian landscape it has stretched to its full height of 1 foot (30 centimeters). In this mosaic of images Sojourner's cameras look back on its mother ship, now the Sagan Memorial Station, which seems to loom above it. 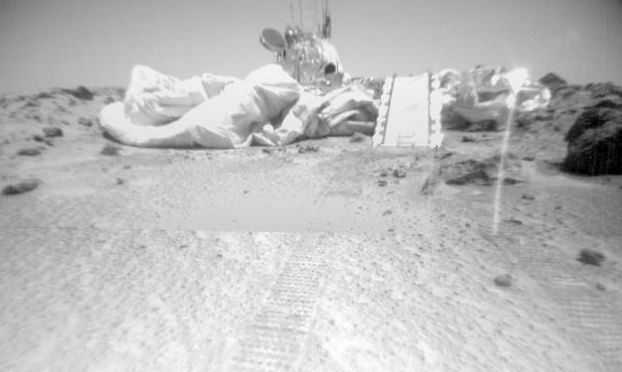 The deployment ramp is visible along with deflated airbags, instrumentation masts and tracks left in the martian soil by the robot's six cleated 5-inch aluminum wheels. So far the rover has been directed to analyze soil and the composition of two rocks, Barnacle Bill (seen just to the right of the ramp) and Yogi. Human operators select Sojourner's targets but the robot rover is relied on to navigate to its destination autonomously. Click here to download a movie gif of Sojourner creeping toward Yogi.